The first weekend of fall will be warm and sticky with only isolated showers possible. 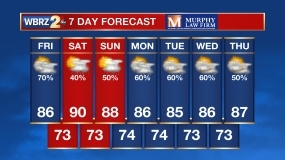 Today and Tonight: Summer weather keeps on rollin’ with Friday’s forecast. The afternoon will bring partly sunny skies with a high temperature in the low 90s. Humidity will be higher than what we felt earlier this week thanks to winds shifting southeast. The evening will be a good one for high school football. At night, skies will remain mostly clear with a low in the low 70s. Up Next: Over the weekend, above average temperatures will continue with highs in the low 90s and lows in the low 70s. Afternoons will feature partly sunny skies and only isolated showers—with considerably lower rain chances away from the coastal parishes. Early next week, we’ll be tracking a cold front sliding eastward across the country. Right now, it is unclear whether or not this front will fully clear the area and bring cooler temperatures and lower humidity. There is better confidence that in its slow approach, rain and thunderstorm activity will increase into midweek. Football Forecast: Both LSU and Southern are heading into Alabama for a Saturday Evening kickoff. Fans making the short trip should dress for hot and dry weather. Game time temperatures will be close to 90 degrees, falling into the mid 80s throughout. The Tropics: Tropical Storm Karl has made the northwestern turn into the Central Atlantic Ocean, drastically strengthening overnight. Maximum sustained winds are 60mph with a minimum central pressure of 1003mb. Karl will eventually turn due north and then northeast over the weekend potentially clipping Bermuda with tropical storm conditions. Tropical Storm Lisa is heading out to sea into the Northeastern Atlantic. With maximum sustained winds of 40mph little additional strengthening is expected and the storm will weaken to a depression over the weekend. Forecast Discussion: An upper level ridge and weak surface high pressure will maintain a generally quiet weather pattern through Saturday. Southeasterly winds are returning moisture to the lower levels while upper level air will feature increasing moisture but remain relatively dry. That being said, with the marine breezes, an isolated shower or storm becomes possible each afternoon through Sunday, but nothing widespread or organized is expected. With the ridge in place, temperatures will run about 5 degrees above average. Beginning Monday, forecast confidence drops. Simply put, models cannot find much agreement or run to run consistency with how next week will play out. The driving force behind all of this is an upper level trough that will enter the Pacific Northwest by Saturday. Once this trough reaches the sounding network, models should get a much better grip on what’s to come. Of late, both the GFS and Euro have trended off of a full frontal passage. Instead, a slow moving cold front is expected to crawl from Texas to West Louisiana between Monday and Wednesday. As it nears the local area, rain chances should gradually increase each day thanks to increased moisture and uplift. Taking the model consensus and siding with the Weather Prediction Center, will currently call for the front to dissipate over the area, never providing a full push of cooler and drier air. Rather, temperatures will come down somewhat due to increased cloud cover, showers and thunderstorms but humidity won’t change much. Given the erratic nature of recent model runs, this portion of the forecast is highly subject to change. One other note, keep in mind that it isn’t uncommon for areas of low pressure to spin up on the tail end of fronts stalled in the Gulf of Mexico this time of year. Forecast models, at least the GFS, are also hinting at that possibility.